Hey Guys, thanks for noticing my car! 1958 MK1 3.4 Auto. I did add spoked wheels as the pressed steel rims were warped and not safe. I could not find originals and I like the spoked better. The cut away spats are in fact original to the 3.4 model, the earlier 2.4 had the full spats. I am sure the MK2 spats do not fit this car. I have the chrome for the front and rear windscreens but I think the prior owner put the wrong rubber seals so at present cannot be installed. The doors/windows are completely original and not the same as the MK2. Thank you again, she has had much suspension and breaking work and is cruising around with ease. 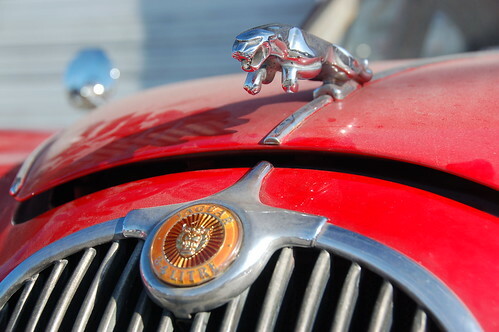 The Jaguar Mark 1 was a saloon car produced by Jaguar between 1955 and 1959. Referred to in contemporary company documentation as the Jaguar 2.4-litre and Jaguar 3.4-litre, the word "Saloon" was often added. The designation "Mark 1" was included retroactively upon its replacement by the Mark 2. The 2.4-litre was the company’s first small saloon since the demise of its 1½ Litre cars in 1949, and was an immediate success, easily outselling the larger Jaguar saloons. In 1951 Jaguar relocated to their Browns Lane plant which provided not merely sufficient production capacity for their existing range, but enabled them to move into the middle weight executive sedan sector, then occupied in the UK by cars such as the stately Humbers, the bulbous Standard Vanguard and the heavy Rover P4. Jaguar’s new 2.4 and 3.4 introduced a modern style and a new level of performance to this respectable company. Although having a family resemblance to the larger Mark VII, the Mark I differed in many ways. Most importantly, it was the first Jaguar with unitary construction of body and chassis. The car’s independent front suspension featured double wishbones, coil springs, and an anti-roll bar. The front suspension subframe was mounted on the body by rubber mounts. The live rear axle was positively located by quarter elliptic leaf springs, trailing arms and a Panhard rod in a manner reminiscent of the Jaguar D-type, being a significant improvement over the other saloons and XK sports cars. The rear wheel track was some 4.5 in (114 mm) narrower than the front track and looked peculiar from behind, a feature that was blamed (probably incorrectly) for excessive understeer at low speed. It was reported to be better balanced at higher speeds. The interior was of similar design to the contemporary Jaguar saloons and sports cars, with most of the dials and switches being located on the central dashboard between the driver and passenger. This arrangement reduced the differences between LHD and RHD versions. Although its profile was very different from that of previous Jaguars, the side window surrounds and opening rear ‘no draught ventilator’ (quarterlight) windows are reminiscent of Jaguar Mark IV saloons. At launch the car had 11.125 in (283 mm) drum brakes but from the end of 1957 got the innovative (at the time) option of disc brakes on all four wheels. Initially, the Mark 1 was offered with a 2.4 litre short-stroke version of the XK120’s twin-cam six-cylinder engine, rated at 112 bhp gross, but from 1957 the larger and heavier 3.4 litre 210 bhp unit already used in the Jaguar Mark VIII also became available, largely in response to pressure from US Jaguar dealers. Wire wheels became available. The 3.4 had a larger front grille, a stronger rear axle, and rear wheel covers (spats) were cut away to accommodate the wire wheels’ spinners. In Autumn 1957 a three speed Borg-Warner automatic transmission became available with either engine. From 1957 the 2.4 also got the larger grille. The car was available in Standard or Special Equipment versions with the former lacking rev counter, heater (available as an option), windscreen washers, fog lights and cigarette lighter. Both versions did however have leather upholstery and polished walnut trim. 19,992 of the 2.4 and 17,405 of the 3.4 litre versions were made. Mark I 3.4-litre saloons competed successfully in many rallies, touring car, and saloon car races, notable drivers including Stirling Moss, Mike Hawthorn, Tommy Sopwith, and Roy Salvadori. • ^ a b c Robson, Graham (2006). A-Z British Cars 1945-1980. Devon, UK: Herridge & Sons. ISBN 0-9541063-9-3. • ^ a b c d e "The Jaguar 2.4 litre". The Motor. July 25, 1956. • ^ "The Lyons share – interview with WL". Motor: pages 18–21. date 19 February 1972. • ^ "The Jaguar 3.4-litre". The Motor. April 10, 1957. • Volunteer maintained online registry where users can register and upload pictures.